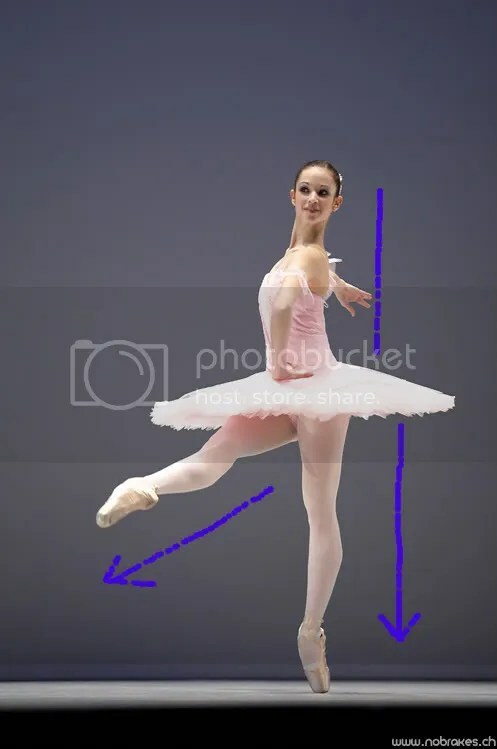 I’ve noticed that this blog is getting a lot of hits from people looking for information about hyperextension and ballet, or hyperextended legs. While I’m not at all an expert (this is a very poor substitute for a teacher or physical therapist), here’s a little bit of information on it that I’ve gleaned from class and other sources. Because much of this is based on personal experience and observation, much of it could be wrong. Just a disclaimer. As I wrote in my older post, hyperextension–and hyperextended legs, in particular–is key to giving ballet its distinctive “look.” The aesthetics of a dancer’s body are all about lines. Even ballet training itself is very much about geometry and structure. Think of how methodical barre is, and how fixed positions are–croisé devant, en face, effacé devant, ecarté devant, derriere, and so on. So when a teacher, critic, or balletomane exclaims that a dancer has a “beautiful line,” they are referring to the lines that radiate from the center of the chest through the arms and legs (and the rest of the body as well, although it is most obvious in the arms and legs…best expressed by an arabesque!). They may also be referring to the outline of the body more generally, but I think that’s slightly different. I always visualized the curves of the arms and legs as flourishes on stick figures; the stick lines supply precision and structure, while the curves are beautiful. The slight tilt of her head shows how deviations from the straight and exact line of the body can be very lovely. Part of the charm of a tutu, of course, is that it enhances and frames these lines (a long floofy skirt, of course, would tend to hide a dancer’s line a little bit more). The tutu above serves in part as a horizontal line, to contrast with the dancer’s vertical ones. When a dancer is said to have a “beautiful line,” she has an ideal balance of these various curvy, straight elements. Part of this also has to do with body proportions, height and weight as well, but that’s another post. I suppose one could imagine the “line” as solely straight or curvy, as you prefer, but I imagine the line as both. It looks like an S. Or in my imagination, an S with an invisible vertical line through it: $. Hyperextension in the legs (but also the arms) is therefore a key element of the curvier side of the equation, to endow the legs with that much-desired “S” shape. This entry was posted in dance and tagged ballet, hyperextended legs on July 4, 2008 by apricot.